I guess the answer is to carry both types with you when hunting & load appropriately. I'd be minded to have standard Accubonds in the magazine & some LR's carried if a 300yd plus shot was needed. I would think that POI shifts between the two different loads would be an issue. I should be testing at 300, 500, and beyond in the next 30-days. It should be interesting to see the results. The 130gr GMX has the same expansion at 500 yards is the 150gr AccuBond LR had at 100 yards. To put this test into perspective, I basically recovered a slug the size of a .223 hunting bullet and its penetration wasn't any better. Depending on where you zero, you're looking at making adjustments for the longer shots in any case, so a range card or good memory is going to come into play no matter what. If you are shooting at long or extreme ranges you need a softer bullet so it will reliably expand at those velocities. How they do that without the bullet blowing apart at 100 yards is quite a feat of engineering. I did a follow-up test at 400 yards and pulled a 65 grain mushroom from the bullet trap. I also used Trail Boss to test minimum opening velocity. Nosler advertizes 1300 fps. The .270 AB LR remained intact at 1400 fps and started to open just below 1500. This was expected because I'm sure the 1300 fps opening velocity is for their heavy .308 bullets. Kinetic Energy is the true parameter for defining when a bullet of the same design begins to expand. For the AccuBond Long Range, that is about 700 ft-lbs which is 1300 fps for their 190gr .308 bullet and just below 1500 fps for the 150gr .277 bullet. I'm guessing you have to be at a range of 800 yards or more to have enough bullet mass left after impact to have adaquate penetration. The two projectiles I pulled from the bullet trap had penetrated as far as the .223 hunting bullets I've tested. Customer reviews of the Nosler Long Range AccuBond have been unfavorable. Many shooters are having accuracy issues because the bullet is so far from the lands when loaded to magazine length. Not an acceptable behavior for long range. It looks like Cabela's stopped carrying them and are just selling out their stock. Only 7mm are left. So SJ. Is this going to be your bullet of choice now for your .270. It sure looks to be very capable for biggame. You did good on your testing. M2, maybe I was trying to be to impartial in my write-up. I was so unimpressed with this bullet that I returned them to Cabela's to get my money back. The 150gr AB LR does not retain its mass well enough to achieve the penetration needed for big game or pass through bone. To put it into perspective, it has the penetration capability of a .223 hunting bullet. This makes sense after I recovered the second one shot at 400 yards because that is the size of the projectile you are left with after initial fragmentation. Looks like I forgot to post a picture of all the recovered bullets. I didn't have the motivation to annotate it as I typically do. The ones recovered on the right were shot at low muzzle velocities using Trail Boss, 1590 fps. They were captured at 25, 100, and 200 yards (L-R) and replicated impact velocities from 1000 to 1200 yards in a .270 Win. I think their "mushrooms" would have been more symmetrical if they had been shot at a higher MV and captured at a longer range because their RPM would have been almost double and they would have stayed more stable during opening. I was able to verify minimum opening velocity with this method, however, which is really Kinetic Energy. The AB LR needs just over 700 ft-lbs of energy to open up which is 1300 fps for their heavier .30-cal bullets and about 1475 fps for the 150gr .277 AB LR. The ogive is so long on this bullet, you may need a rifle specifically built for this round to shoot it accurately. Thanks for the clarification on these SJ. M2, if you have time to burn, check out the consumer reviews on the different buying sites. Not too many positive words. I decided to pull some of the 150 AB LRs to take a different approach to my loads and COALs. I was going to go for longer COALs and get them closer to the lands. That would mean shooting them single shot. I found out just how soft these bullets are. 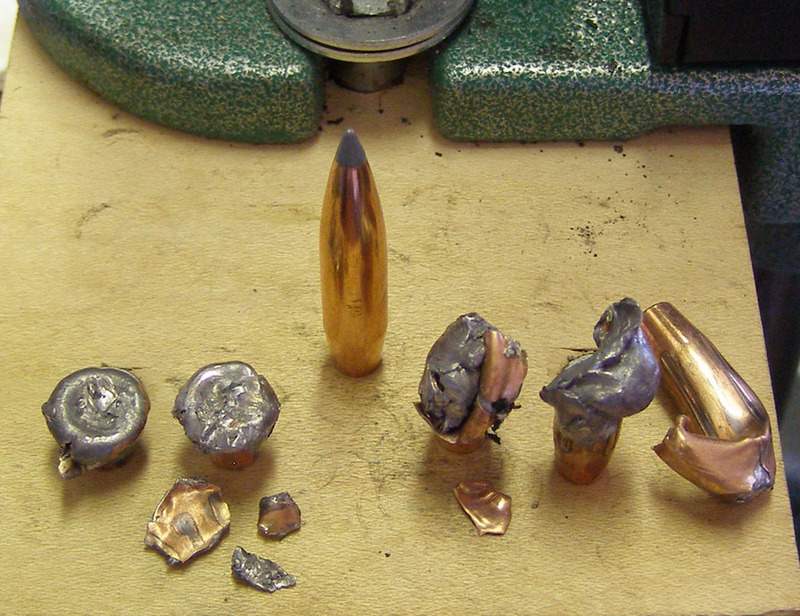 I could only pull half of them because the AB LR bullets deformed and slipped right out of the collet. Looks like it is best use an inertial puller with this bullet. nope I definitely wont be using any of those!!!! Your findings are pretty much what I would have expected !!! Building a hunting bullet that works from 0-1000 yards is no easy task. With such a bullet one needs to realize that there are going to be compromises and shortcomings. The first thing one needs to understand is a bullet of this nature is not going to be a bone crusher. Disciplined shot placement needs to be limited to broadside or angling away type shots. Full penetration is no guarantee. In fact the soft nose of the bullet is going to shed energy rather quickly. Your test have shown this with only 37% weight retention with some fragmentation occurring. Keep in mind that as the distance grows and velocity lowers the more likelihood that the bullet will retain more weight and less fragmentation will occur. I believe that greater penetration may also occur. My assumption of this bullet is it will have a sweet spot somewhere around 300-900 yards that will work a lot like a Ballistic Tip. Inside 300 it will rely on it's bonded construction to stay together and get the job done. Beyond 900 it's ability to expand at low velocities will act more like the low powered cartridges of yesteryear. I know initial reviews look bad but only time will tell. Remember, the Ballistic Tip was doomed to failure when it first came out. It however overcame that once hunters understood it's strengths and weaknesses. Nosler bullets have been my go to hunting bullets for years but IMHO they've done a poor job at getting hunters to understand their product. chambered, the problem I have had with this bullet is expectations ... the expectations that Nosler set. They make you believe that you are getting a bullet that performs like an AccuBond. They do this including listing the same purpose for the Long Range as they do for the AccuBonds - "Deer, Moose, African Game". I can see this round being used on deer (I don't know how much meat will be left because this bullet fragments more than any I have tested). But there is no way I would use this bullet on Elk and don't understand how they could list "African Game" when this .277 bullet doesn't penetrate any better than a .223. So far I've only tested to 400 yards. I'm still going to work with it, improve accuracy, and learn more but, IMO, this bullet is no Accubond. The reviews have been mixed and most of the negative ones are for the .277 caliber and seem to be associated with accuracy because the bullet is so far from the lands if you load to magazine length (that's why I'm going to load long and take single shots.) I think just about every thing you say is true, Nosler just doesn't tell the same story. Another factor that might have contributed to the expectation issue is I would bet that the Nosler write-up and recommendations are based on the heavy weight .308 bullet which the slightly smaller calibers may not come close to. IMO Nosler should have named this bullet differently......it's not a Accubond !!! It's a long range bullet that incorporates the Accubond bonding process. Don't let the lack of penetration fool you. I shoot 120gr B-Tips that have stopped in the chest cavity on a number of occasions. Those animals dropped dead in their tracks.......DRT !!! I'm sure this bullet would drop a deer in its tracks and even an elk if presented with a nice broadside lung shot. With that much fragmentation (close to 100grs of tiny fragments), this bullet will grenade the lungs and heart - very lethal. I'm concerned about meat loss and if I need penetration on a quartering shot on elk. It will be interesting to see how this bullet hangs in the market place. It definitely has a niche. funny how things turn full circle..at one time the .270 got a bad name as you seemed to have 2 choice with factory ammo either too hard or it blew up causing meat damage. I stopped using standard hornady projectiles in mine as I found they didnt expand much so I looked for something softer (taipans) and now are happy to shoot 170grain speers!!!! these bullets look to be ideal in a search n destroy type role. they SHOULD be simply awesome on feral goats. the issue of meat damage has lead people to use full metal jacket projectiles for meat or skin hunting in the past. you can buy 150grain fmj flat point projectiles now designed for meat hunting!!! !